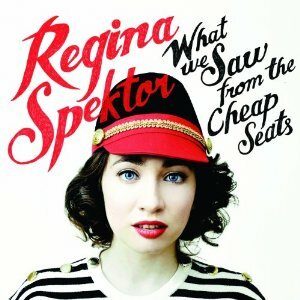 Regina Spektor’s always been a unique singer-songwriter: quirkier than most, but never too weird for her own good. Her sixth album, What We Saw From the Cheap Seats, explores various aspects of her personality, and its highlights sit among her finest. “All The Rowboats” marches urgently on a sinister backbeat. “How,” a lovelorn tale of trying to move on after a breakup, reaches a new level for someone who’s done fine slow burners before. Overindulging her kookiness, though, results in missteps. “Oh Marcelo,” with verses done in an exaggerated Italian accent, sounds like two afterthoughts smashed together. “Don’t Leave Me (Ne Me Quitte Pas)” is a remake of a track from her 2002 LP, Songs. It’s jaunty, but the new arrangement clashes with its descriptions of snowy New York. Cheap Seats begins with “Small Town Moon,” a song she’s performed live, but has never recorded. “How can I leave without hurtin’ everyone that made me,” she pines, as if wondering whether outgrowing her trademark eccentricities could alienate her fans. If she continues to aim straight for the heart more often than the funny bone, she’ll have nothing to worry about, she’ll be great. Right now, though, she’s still really good.